With so many metal options out there, how on Earth will you decide which one works best for your jewelry needs? It’s really a matter of your style, and what you feel looks best on you or the person who may be receiving a gift. From a style perspective, someone who wears a lot of Earth tone colors may be better suited to pair gold accessories with their attire. A personal style of one who tends to gravitate more towards the variations of black, white, and gray, may benefit more from wearing platinum and silver. Whatever your personal style may be, we have the perfect metals for you to choose from. Let’s take a look at the different metals we offer, and help you make a better decision on which ones suit you best. Raw platinum is naturally a white metal. Unlike gold, it is used in jewelry in almost its purest form (approximately 95% pure). 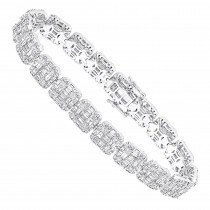 It’s extremely long-wearing and very white, so that means it does not need to be rhodium plated like white gold does. Platinum is also a very dense and heavy metal. A ring made of platinum will feel much heavier than an ring made of gold. This particular metal will also be more expensive than gold. A platinum ring can be approximately one and a half times more expensive than the price of an 18k white gold ring...so that is something to consider as well. Platinum does have a hint of prestige associated with it. It’s often chosen for its allure to the rich and famous. Can you count how many times you’ve heard music artists make references to their “platinum watch and chain”...wearing this expensive metal is definitively a status symbol. Traditionally, platinum was not used in the full range of jewelry products due to its higher price. Platinum was mainly used in Platinum Engagement Rings, Womens Wedding Rings and Men's Wedding Rings and Diamond Eternity Bands. Today, platinum is often used to make earrings, pendants, bracelets and necklaces. This metal gives you the option to pair it with jeans or dresses, allowing you to “dress up” your outfit, if it has a minimalistic look. 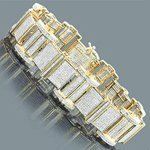 Gold is the most popular choice for Men's and Ladies Wedding Rings and Engagement Rings. Gold is also very popular in rings, earrings, pendants, necklaces and bracelets. Yellow gold is made by mixing pure gold with alloy metals such as copper and zinc. White gold is an alloy of gold and some white metals such as silver and palladium. In practical terms, 18k generally holds up to everyday wear better than 10k, and tends to look better as it ages over the years. This is one of the reasons why 18k is normally preferred for ladies engagement rings rather than 10k. 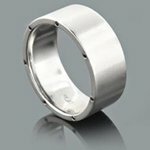 18k is the superior metal for ladies and men’s wedding rings provided that the ring is not of lightweight construction. However, 18k is more expensive than 14k and 10k, which is usually fine for ladies engagement rings. Men's engagement rings in 18k can be noticeably different. 10k, 14k and 18k are each equally suitable for use in rings, earrings, pendants, bracelets and necklaces. 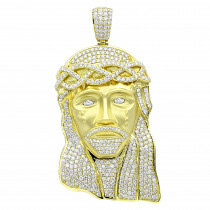 Many people choose 10k and 14k for their earrings and pendants due to its lower price. Silver is a white-grey colored metal which is the least expensive of gold, platinum, and titanium. Silver is a softer metal than gold, titanium and platinum, and does not have the hardness that the other metals do. However, sterling silver has 7.5% copper which makes it a little harder. This is a popular metal for use in jewelry such as earrings, pendants, bracelets, necklaces and rings. 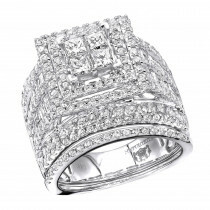 It has seen significant demand for diamond jewelry in recent years. 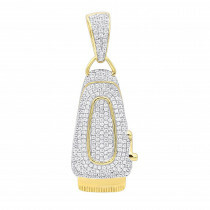 Due to quick rising costs of gold, silver has definitely become a contender in the diamond jewelry market. This demand has inspired jewelry manufacturers to increase selection and quality tenfold, making it a more than viable option to gold. Unfortunately, silver is also more prone to oxidation. Oxidation can cause the silver to turn black. It’s not necessarily a bad thing though. Oxidation is a process that some companies use to age their jewelry...it gives it an antique look. If you do like the antique look, check out our antique diamond engagement rings! If your silver jewelry does oxidize, and you don’t like the aged look of it, you can easily make it look new again by using a silver jewelry cleaner. 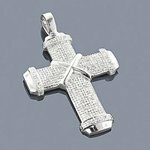 Silver jewelry cleaners can typically be found at most jewelry stores. You can also have your jewelry cleaned by a jeweler if that’s what you prefer. For centuries, silver has been considered as a multi-purposed and valuable metal after gold. It just seems like silver is always second to gold, but that aspect still doesn’t take anything away from silver. Next to gold, silver is a popular choice of metals among artisans to create artsy and decorative masterpieces. In ancient times, many associated the moon with silver because of its color variations of white and gray. Gold was more so associated with the sun. Silver was thought to be the perfect metal, second to gold of course, by the Egyptians. Gold’s symbol was a circle, while silver was a semicircle. During the early times of mining, it was discovered that silver ores had been linked to lead. Because of that, slaves were forced to work in the mines so that free men wouldn’t face the risk of dying from lead poisoning. Deaths from lead poisoning led to major breakthroughs in silver mining. These breakthroughs allowed for differentiation between silver and ores, so this definitely helped aid with deaths linked to lead poisoning. Silver also had many uses. Wealthy families had silver jewelry, decor, and eating utensils. In fact, it was quite common in those days for a family to have upwards of a 100 piece silverware dining set. Silver was not only used as a form of currency for trade and the payment of debts, but it was also a symbol of love and trust. Around this same time sterling silver was also utilized for jewelry manufacturing. However, since the price of gold kept increasing, sterling silver had become a viable option, not only for inexpensive purchases such as gifts, but also for a wide variety of larger, even custom made, intricate items. Silver was also considered to be one of the seven sacred metals in alchemy (before the assembling of the periodic table). The seven sacred metals included: lead, tin, iron, gold, copper, mercury, and silver. Did you know that silver was also used in early medicine? It was used as a liver and spleen detoxifier. Not too many people knew that silver had antibacterial properties and was used in medicine before antibiotics were created.